Mechanical keyboards are brilliant: they feel great to type on, you can customise them with fun keycaps and they’ll last for approximately one billion years. However, they’re often expensive too, with premium models easily costing £100 or more. 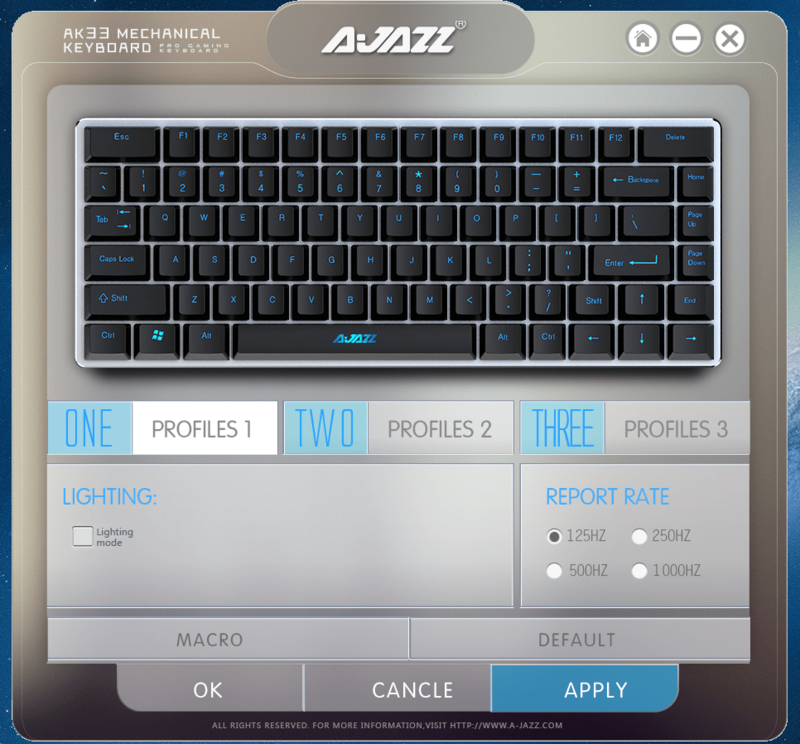 That makes the A-Jazz AK33 a breath of fresh air: it’s a full mechanical keyboard, complete with Cherry MX-style switches with trendy RGB backlighting, for just £40. Is this gaming keyboard the deal of the century, or are A-Jazz cutting corners where it matters? Let’s find out in our full review. We recorded a brief unboxing video, just to give you an idea of what is provided with the keyboard and how it is packaged. The AK33 RGB is a 75% size keyboard, which means it’s a little bit smaller than even a TKL (tenkeyless) design. That means you get all of the major keys and the F keys, but there’s no numberpad and a few little-used keys are accessed via a Function (Fn) layer. Our keyboard is available in a UK layout, so we have a tall enter key and a short left shift key as normal. Apart from the right side of the keyboard which is necessarily different, the layout is quite standard and shouldn’t require too much relearning. Note that the right shift is 1x size, the delete key is in the upper right corner, and the arrow keys are 1.25x size keys instead of the usual 1x. The keycaps themselves are made from ABS plastic, with laser-etched legends that allow the lights below to shine through. The keycaps are easily removed by rocking back and forth while pulling up, even without a key puller (which is not provided). The larger keys, like Space and Enter, use Cherry-style stabilisers, which are arguably a little less stable but inarguably easier to deal with when swapping caps. The keyboard is mechanical, with ‘Zorro’ Cherry MX-style switches in various colours. Our review unit uses Reds, which are a light, linear switch, lacking the added tactile or aural feedback that you’d expect from a Brown or Blue switch. You can see how the mechanism works in this illustration from user Lethal Squirrel on Geekhack. 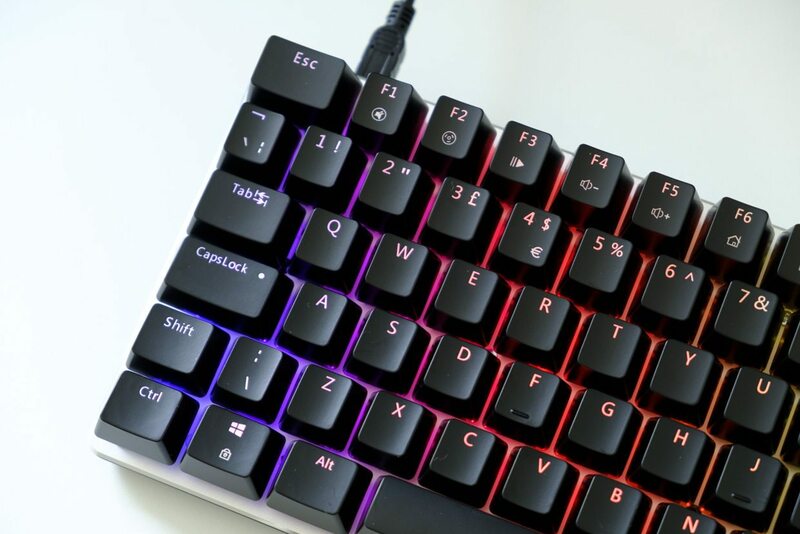 Red switches are weighted at 45 cN, making them the lightest Cherry MX-style switch, and often promoted as being a good switch for gamers, particularly in the FPS and MOBA genres. Personally, we believe it’s a matter of taste. The chassis of the keyboard is made from silver-coloured aluminium, with shiny beveled edges around the perimeter. There’s the bare minimum of added space around the keys, so the AK33 has a minimal footprint. That’s great for portability and replacing keycaps, but it does mean you’ll have to be a bit more careful when transporting it to prevent damage to the keycaps and switches — a nice padded bag would be ideal. The bottom of the keyboard is made from glossy black plastic, which seems a strange decision given that it won’t often be visible. The glossy material picks up fingerprints pretty rapidly, so you may need to wipe it down with a cloth from time to time. There are no DIP switches or other controls here; just the usual arrangement of flip-out feet to alter the angle of the keyboard and prevent it from sliding around your desk. 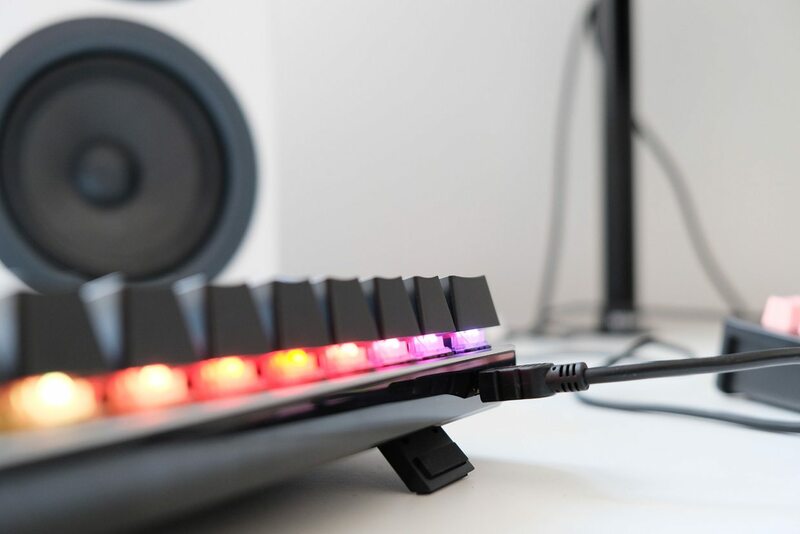 The keyboard connects to your PC via a removable Mini USB cable. This is nice for portability and can prevent some damage during transport, but the port itself can also wear out with repeated use. The cable itself is quite ordinary, unbraided and with no velcro tie provided. If you want to see how the AK33 compares to another popular RGB model, the Razer Blackwidow Chroma Stealth Tournament Edition, you can check out the video below. 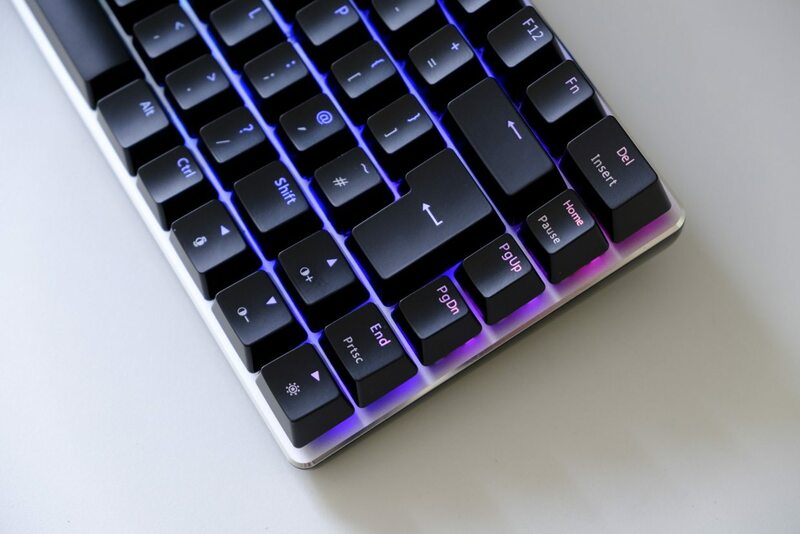 One of the unique selling points of this keyboard is delivering trendy RGB lighting at a very low price — but what can you actually do with the backlighting, both with and without the keyboard’s software installed? First, let’s look at what’s possible without installing anything on your PC. You can swap between — if we counted correctly — 19 different modes, far in excess of what we’ve seen sans software from other RGB models. You can have full backlighting, waves, reactive spirals, rainbows of all kinds, random pastels, and several other choices. These modes can also be modified on the keyboard itself; you can change the colours used (from several nice presets), the direction in which waves travel, the speed of the effect and of course the brightness. Given these controls, it should quite easy to find at least a couple modes that delight you. 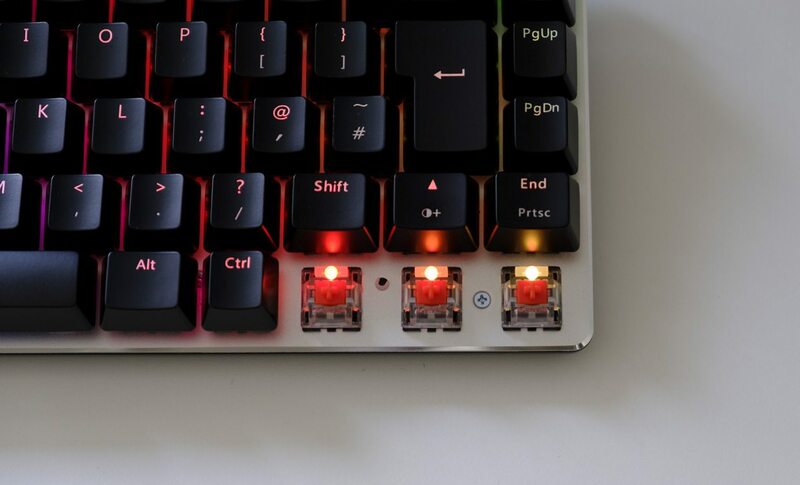 You can also turn the backlights of individual keys on and off. By default, you’re given the usual gamer keys of WASD + 1-5, but you can change this to anything you wish. Enter the mode, then tap on a key to change from unlit, to one of a half-dozen predefined colours. This makes setting up your most-used keys for a given game quite rapid, and the keyboard will remember your assignments for the next time you activate the mode. To download the software, you’ll need to brave A-Jazz’s website, which regrettably is only available in Chinese. However, navigating it is pretty easy; just go directly to their Download page and click on the second line of the menu on the left — this should read 键盘, which means keyboard! From there, you’ll see AK-33 RGB driver English, so click on that and you should get the most recent version. It’s all pretty straightforward, if a little rough around the edges. You can change the report rate to 1000Hz, and change lighting modes directly in the software. You can also change between three different profiles, if you want to set things up differently for different users or different games. The names of the lighting modes are quite wonderful – ‘go with the stream’ is a simple RGB or single-colour wave; ‘the trial of light’ gradually shifts through the colour spectrum, ‘flowers blooming’ gives you a fun explosion of colour and ‘Fast and the Furious’ gives you an ever-expanding (or contracting) pulse of RGB light. It’s also possible to record macros by pressing the Macro button at the bottom. Simply name your macro, record the action you want to automate, and assign it to a key. You can change the delay and repeat the macro a set number of times too; it’s pretty comprehensive. Once you’re done recording your macros, close the macro section and click on a key on the keyboard represented above. You’ll have the option to rebind the key to a macro, or indeed change it to any other key on the keyboard. We tested the AK33 RGB in a range of games, including old classics like Counter-Strike and Civilization and newcomers like Torment: Tides of Numenera. If you are playing a game that uses many hotkeys, you may prefer a traditional full-size keyboard. For example, many CS:GO pros use the numberpad to buy weapons, grenades and armour more quickly than they could by navigating the buy menu manually, and there aren’t many free keys here for these extra functions. But outside of flight simulations and other specific genres, the AK33 RGB should be more than up to the challenge. The addition of custom lighting modes can also be helpful, as you can just light the keys that you’re using. We tested the keyboard by using it as our go-to work keyboard for one week, including writing up this very review. 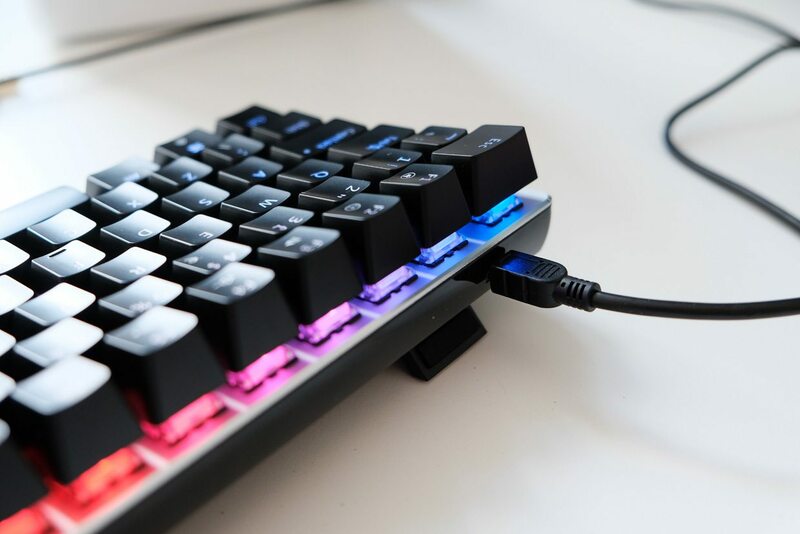 Overall, the keyboard felt as we expected, with predictably light and linear action that made typing quite comfortable, on par with other Cherry MX-style Red switches on the market. Typists may prefer switches that include more tactile (Brown) and/or aural feedback (Blue), but as we mentioned above this is largely a matter of taste. If you’re not used to mechanical keyboards, you may find these switches so light that you end up pressing keys accidentally. Happily, this habit should go away naturally after a few days of use. Of course, a keyboard more than a collection of switches — layout, keycaps, lighting, software and added features can all play a role in making a keyboard better or worse for typing on. Thankfully, we didn’t find any deal-breakers when it came to typing. The layout is largely standard, and we didn’t face any difficulties adapting to the compressed layout of the navigation and cursor keys on the right hand side. The Function layer proved useful for rapidly adjusting the volume or opening an email client, although skip forward and skip backward buttons were noticeably absent. The backlighting was strong and even, and the legends were easily readable regardless of the level or settings of the backlight beneath. The portability of this keyboard was also welcomed, as it allowed us to use it on trains and planes for writing up articles on the go. Overall, we were impressed with the AK33 RGB. Its build quality feels up to par, its switches are consistent and its litany of RGB backlighting options are tons of fun. There are a few rough edges here and there compared with similar offerings from Razer or Corsair — a few misspellings in the software, no game developer support for custom lighting modes — but given the price differential, these are entirely excusable flaws. Interesting keyboard, I would love to get my hands on this one. Although anywhere I look I only see it with the ANSI layout (with the little Enter button and a few less keys) instead of the ISO layout shown here. Also I can see versions with blue or black switches instead of the red switch here. Any idea where can I purchase the one shown in the review? This is the link I was given by the distributor, which lists UK (ISO) layout and red switches. I would love to buy this ISO version red switch keyboard somewhere… but where? As you have pointed out, UK version is available, but UK is not ISO, at least not all the time according to images.google.com. The picture on that link is definitely not ISO. What gives? Available for preorder seem at least workable for me, I may end up doing that… However I realize from the review that the enter key is the tall iso one that I want (and require) but since I am swedish, I dont know how the uk layout should look. http://kbd-intl.narod.ru/english/layouts#uk-extended seems to indicate something other than what you are saying. Is there an official list of keyboard layouts somewhere that puts my fears to rest? Anyone knows where I can still buy this in the UK? It seems to be discontinued, and there’s no equivalent alternative on the market.